Depending on how you calculate it, there are several "most popular" Greek islands. But travelers beware - the "most popular" Greek islands are usually the busiest and most expensive as well - but may not be the most beautiful. Check to see which one fits your own travel style. By most counts, Santorini is definitely the most-visited Greek island. 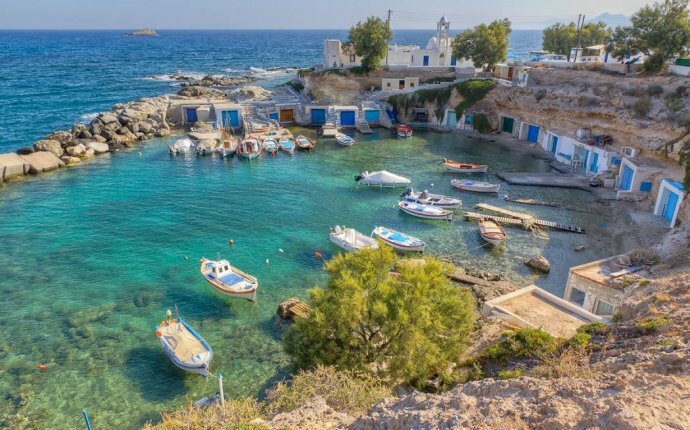 It's a regular stop on most of the cruise lines serving Greece, and can also be easily reached by plane, ferry, and hydrofoil from mainland Greece and many other Greek islands. Santorini takes top honors in the wedding sweepstakes, with more foreign weddings taking place than any other Greek island. It's also the top honeymoon location - though launching married life on the top of a still-active volcano has never seemed to be the best idea to me. Many Greeks find Santorini too expensive and too overrun with foreign tourists, though it still ranks highly for romantic getaways. (What is it about love and sulphur, anyway?) They flock to Paros, Skiathos, Aigina, and Evvia. The international jet-setting island of Mykonos was first to become popular with gays, and it still holds this distinction. For gay women travelers, the Greek island of Lesvos or Lesbos is a kind of pilgrimage spot as the home of famed Greek poetess Sappho, who ran a school for girls on the island about 2500 years ago. But history-minded gays may also want to give Santorini a look - excavations found ancient graffiti in what was once a popular cliff-side hang-out for young men, and some of the inscriptions read the ancient Greek equivalent of "Jake loves Jack!" Interestingly enough, these are among the very earliest Greek inscriptions found anywhere. The rest of Europe loves Greece and certain islands seem to almost belong to tourists of one nationality or another. While everyone is welcome everywhere, if you are looking to spend your vacation in Greece with your fellow citizens, here is a list of some of the islands by tourist origin.